Patented QuadTruss® design (patent #5,390,803) makes shelves up to 25% stronger. Heavy-gauge open-wire construction keeps contents visible for quick inventory checks. Mobile Security Units feature 5" diameter swivel stem casters with poly tread, two with brake. Casters are nickel-plated. All units are plated with a durable easy-to-clean finish. Quick-action locking feature with hasps for padlock. All units feature full-access double door swinging out at approximately 270°. Shipped knocked down for easy assembly and reduced transportation costs. CSC2430E 27 1/4" x 33 1/4" x 69" EAGLEgard® mobile, full-size security unit. Includes 4 poly stem swivel casters 5" x 1 1/4", two with brakes. 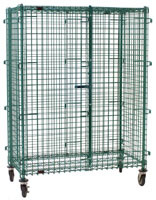 CSC2436E 27 1/4" x 39 1/4" x 69" EAGLEgard® mobile, full-size security unit. Includes 4 poly stem swivel casters 5" x 1 1/4", two with brakes. CSC2448E 27 1/4" x 51 1/4" x 69" EAGLEgard® mobile, full-size security unit. Includes 4 poly stem swivel casters 5" x 1 1/4", two with brakes. CSC2460E 27 1/4" x 63 1/4" x 69" EAGLEgard® mobile, full-size security unit. Includes 4 poly stem swivel casters 5" x 1 1/4", two with brakes. CSC3030E 33 1/4" x 33 1/4" x 69" EAGLEgard® mobile, full-size security unit. Includes 4 poly stem swivel casters 5" x 1 1/4", two with brakes. CSC3036E 33 1/4" x 39 1/4" x 69" EAGLEgard® mobile, full-size security unit. Includes 4 poly stem swivel casters 5" x 1 1/4", two with brakes. CSC3048E 33 1/4" x 51 1/4" x 69" EAGLEgard® mobile, full-size security unit. Includes 4 poly stem swivel casters 5" x 1 1/4", two with brakes. CSC3060E 33 1/4" x 63 1/4" x 69" EAGLEgard® mobile, full-size security unit. Includes 4 poly stem swivel casters 5" x 1 1/4", two with brakes.